one will have prominence 804m, the other 164m. 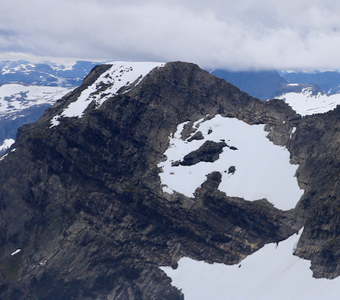 The best starting point for this climb is Nedste Mardalsvatnet (839 meter), near the famous Mardøla waterfall. There is a road built as part of the hydro power project that ends at this lake. This road forks off the E-136 (connecting Åndalsnes with Dombås) 5 kilometer from the ski area Bjorli, in the direction towards Åndalsnes. Driving towards Åndalsnes, you should fork right onto a small parking area before the main road crosses the railroad. The small mountain road starts from this parking area. Follow this road for 30 kilometer in order to reach Nedste Mardalsvatnet. Park off the road in one of the sharp bends before the road completes its descent to the lake. I parked at location N62.48818, E008.06699, elevation about 910 meter. Note: Hauduken and Hoemtinden have the same elevation. Hoemtinden is located 1.6 kilometer north-east. The two mountains are connected by a sharp ridge that may require the use of a rope and thus not very suitable for a solo traverse. 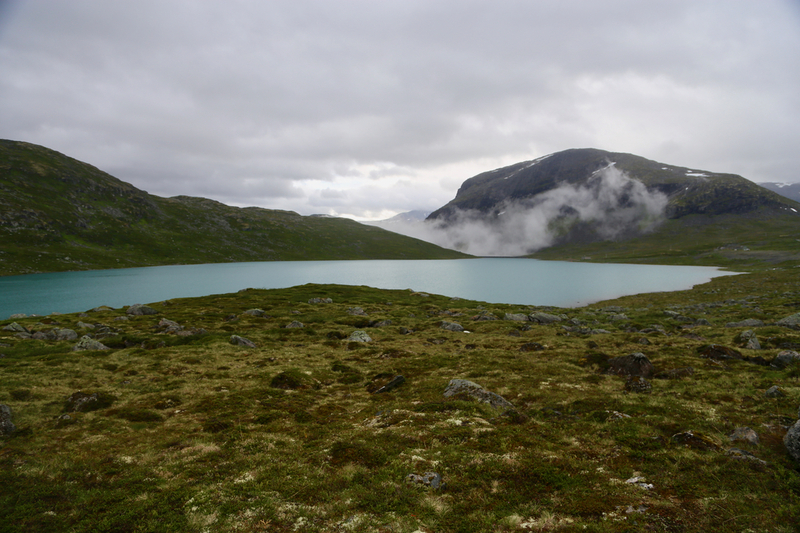 It is somewhat amusing to observe that the distance from the (best) trailhead for Hoemtinden, Vike along Eikesdalsvatnet, and the this trailhead at Nedste Mardalsvatnet, is 160 kilometer by car, that is 100 times the distance between the two peaks. This may perhaps be a record at least for peaks in Norway. From the trailhead, first walk north with the Nedste Mardalsvatnet on your right hand side. Almost immediately, you cross a small river, normally this should be easy. Continue north until you reach the north side of Midtre Mardalsvatnet. Cross the wide, but shallow river, there are lots of rocks and one should be able to cross without getting wet feets with reasonable boots. Continue north-east to cross a final river that connects to the lake Indre Haudukvatnet, again this should also be possible without getting wet feet. 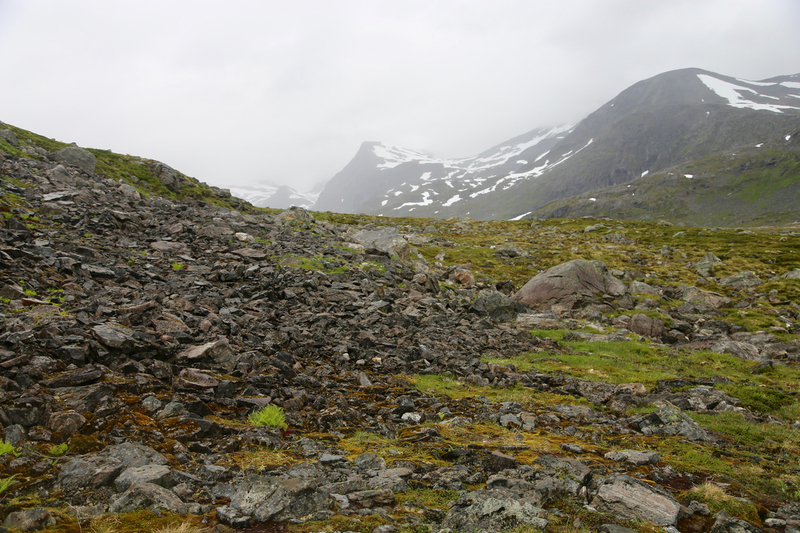 With the river crossings completed, proceed north (west of Rangåtind) up the slope to gain a plateau at about 1200 meter of elevation (east of Indre Haudukvatnet). Contour a bit right as you turn into the valley going east towards point 1371m, the main col south of Hauduken. Turn left and ascend the south ridge of Hauduken. Initially, the terrain is nice to walk, you will negotiate a short (easy) step, then run into more boulders that produce somewhat more cumbersome walking. 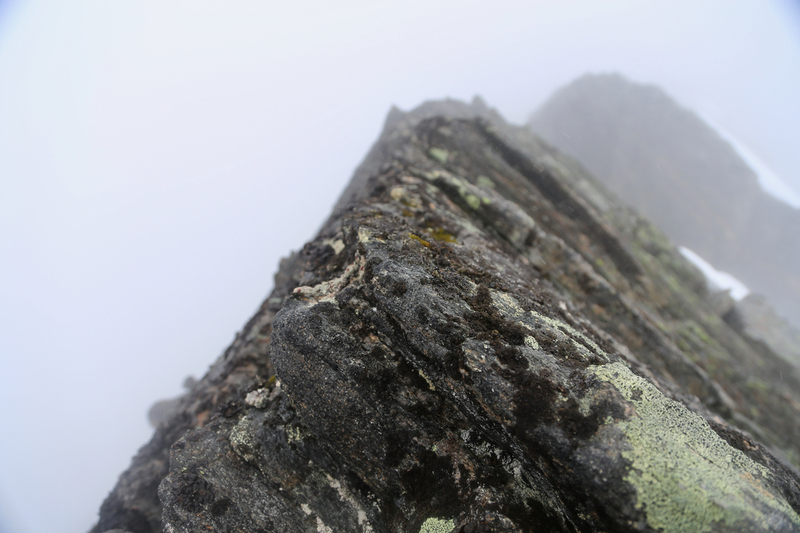 Finally, near the top, the ridge quite unexpectedly narrows and looks a bit more challenging. As it turns out, there is no real difficulty since there is good footing on the right hand side. You will also descend a couple of meter while the ridge stays narrow. The terrain changes after this, the easiest way to proceed is along some ledges on the left side of the highest ridge. 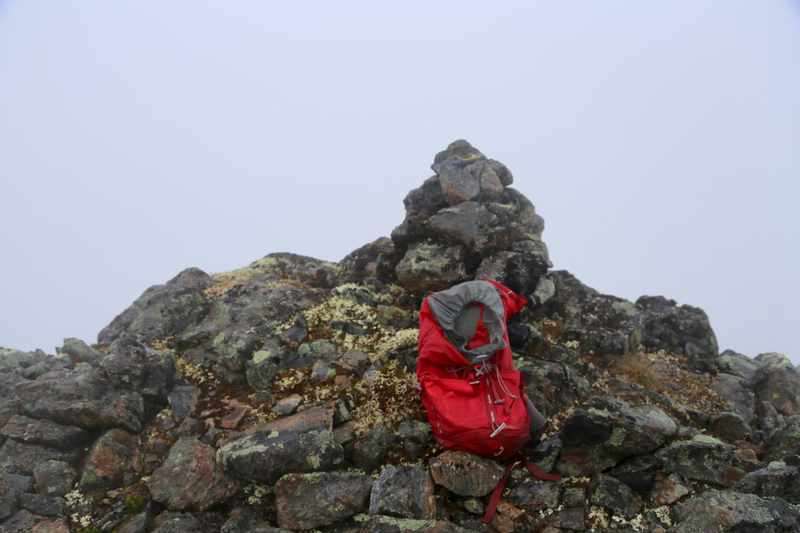 Finally, you reach the big summit plateau, cross to the north end where a small summit cairn marks the highest point. After climbing Hoemtinden, my next goal was Hauduken since these two mountains now have the same official elevation. Thus, one cannot know which of them has more than 800 meter of prominence. When on Hoemtinden, I could easily look across to Hauduken, the distance between the two summits is about 1.6 kilometer. To drive between the two trailheads, however, takes several hours (see above). I arrived in the evening and slept well in my car to the next morning. The day arrived with low clouds, but without rain. I left at 0815 and had a nice hike along the lakes and across 3 rivers without getting wet feet. 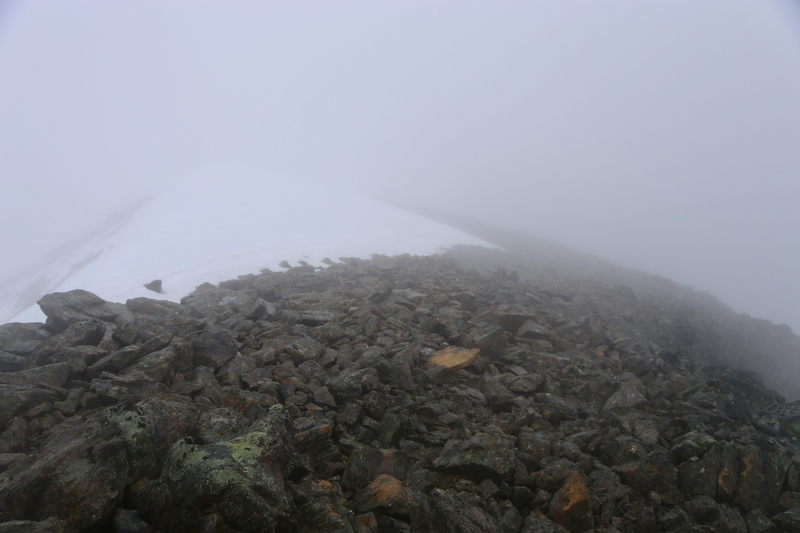 At about 1200 meter, I ran into a large patch of snow that continued all the way to the col just below the south ridge. 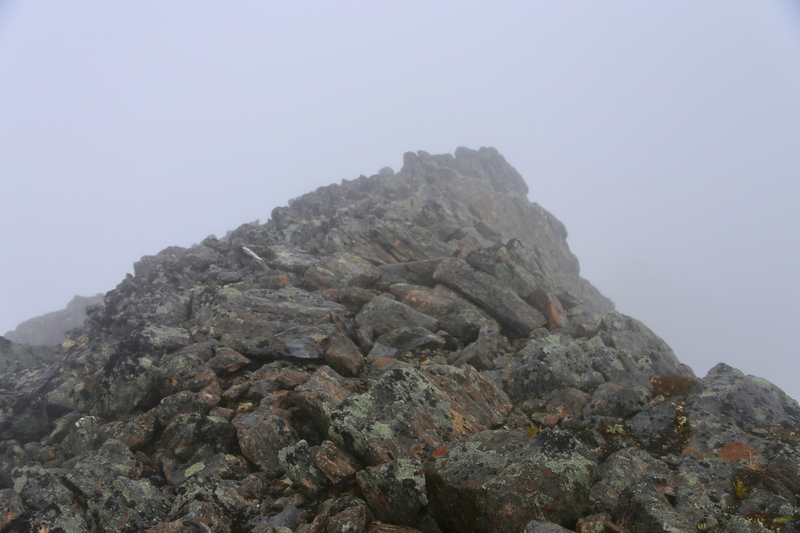 I had expected the ridge to be full of boulders, but otherwise quite straightforward. Thus, a bit of surprise when I actually ran into a narrow section. There were no problems and at 1150 I was on top. Unfortunately, there was no view back to Hoemtinden. Leaving at 1205, I had an equally pleasant walk back to my car, arriving there at 1520.